Welcome to the Syracuse Biomaterials Institute! We are an interdisciplinary institute focused on research in biological materials, from the properties of individual cells, to their organization into tissues and organs, to the development of smart medical devices. Areas of focus range from applied biomaterials research, aiming at designing natural and synthetic substances designed to treat, augment, or replace tissues and organs of the human body as treatments to disease or injury, to fundamental research into the interactions between biological matter and non-living materials. 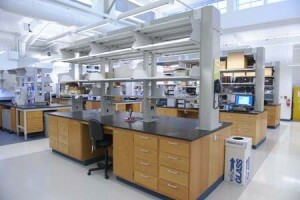 An outgrowth of the long-standing Biomaterials Group in the Biomedical and Chemical Engineering Department, the Syracuse Biomaterials Institute (SBI) was launched in Fall, 2007, through strategic investments by Syracuse University, New York State Foundation for Science, Technology and Innovation (NYSTAR), and private donations. SBI is a cohesive collection of highly collaborative faculty spanning eight (8) academic units, including faculty from College of Engineering and Computer Science, College of Arts and Sciences, SUNY Upstate Medical University and SUNY College of Environmental Science and Forestry. Our researchers are engaged in a wide spectrum of problems, ranging from fundamental studies of the biochemical and physical processes controlling cell functions to the development of new technologies for biomedical applications. In addition to our collaborative research and teaching activities, we have moved into our new SBI home located in the newly renovated Bowne Hall and where we have established our Central Research Laboratory Facilities. We encourage you to explore the SBI website and please feel free to contact us with any questions.